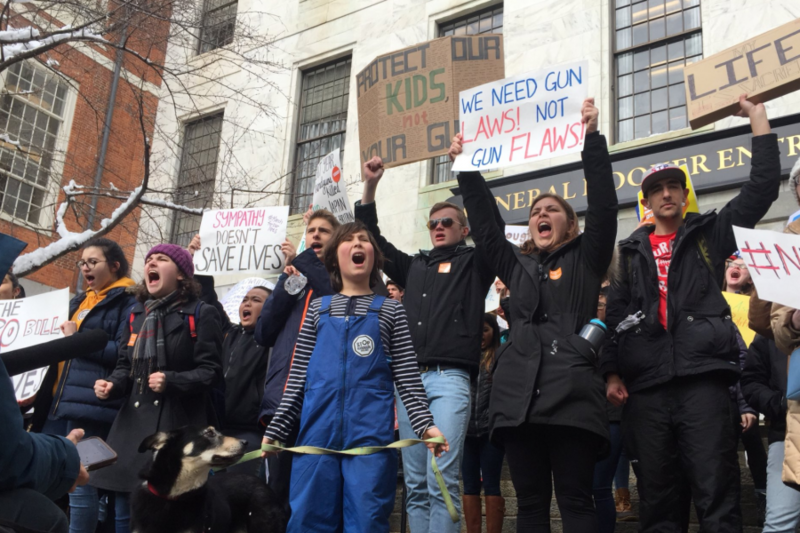 Even though school closures foiled area students’ plans to walk out of class on Wednesday, a crowd of hundreds of young people turned up at the State House for a rally and day of lobbying to pass gun control measures. Waving signs reading “WE NEED GUN LAWS! NOT GUN FLAWS!” and “NEVER AGAIN,” and chanting “enough is enough!” and “we want education, not annihilation!”, they marched from the Cathedral of St. Paul to the steps of the state capital and then made their way inside. Working in partnership with groups like the Massachusetts Coalition to Prevent Gun Violence and Moms Demand Action, they say they’re urging legislators implement extreme risk protective orders via a so-called “red flag” law that would empower judges to order gun seizures if petitioned by family members or housemates. A similar, but not identical, law was signed by Florida Gov. Rick Scott last week as part of a package of gun reforms. They also called for federal gun control policies, like an assault weapons ban akin to the one we have in Massachusetts, and had tough talk for the local affiliate of the National Rifle Association, the Gun Owners Action League. The organization has sued to overturn the state’s ban on assault weapons. Students who arrived in Boston hailed both from inside the city and from surrounding communities, representing from schools in Somerville, Cambridge, Arlington, Revere, Winchester, Wellesley, Waltham, Medford, and Shrewsbury, among others. Some said they wanted to speak out because they felt the impact of gun violence in their day-to-day lives, and not just every time there’s another school shooting. The day of action happened under a blue sky, but after a nor’easter dropped a heap of snow on Boston and beyond, leading to widespread school closures. Students said they were determined to lead their day of advocacy regardless of the weather. “This is about showing our leaders that two feet of snow isn’t going to stop us,” said Maren Larkin, 16, of Arlington High School. Students later gathered inside the State House’s Gardner Auditorium, where they spoke in front of a collection of state legislators who were receptive to their policy goals. Those who addressed students included a Republican, Senate Minority Leader Bruce Tarr, of Gloucester, who cheered bipartisan accomplishments on gun control in Massachusetts and said he hoped to see that reflected in Washington.